Contributions from Offshore Industry, Ships, Fishery, et cetera? Abstract: The marine environment of North Sea and Baltic is one of the most heavily strained by numerous human activities. Simultaneously water and air temperatures increase more than elsewhere in Europe and globally, which cannot be explained with ‘global warming’. 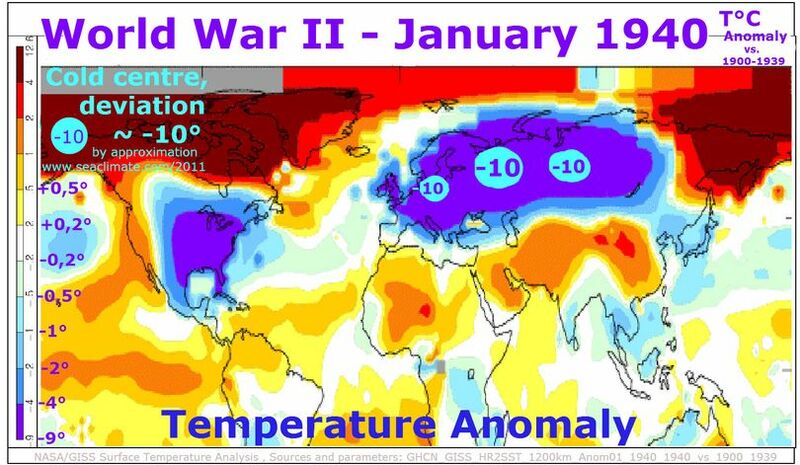 The climatic change issue would be better understood if this extraordinary regional warming is sufficiently explained. The regional features are unique for in-depth studies due to different summer-winter conditions, shallowness of the seas, geographical structure, and main pathway for maritime weather patterns moving eastwards. The impact of sea activities on the seasonal sea water profile structure is contributing to stronger regional warming, change in growing season, and less severe sea ice conditions. The impact of the man, whether small or large, should be understood very soon and very thoroughly. Keywords: Human maritime activities, sea temperature increase, North Sea and Baltic warming, change in seasonality, sea ice decrease. 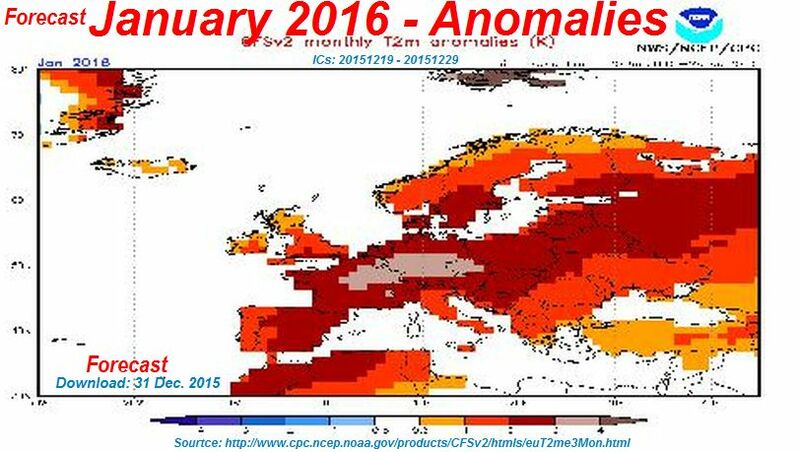 Northern European winters are getting warmer and warmer at a rate higher than global average. Last winter 2014/15 hardly occurred. Can anthropogenic activities in the North Sea, Baltic and coastal seas be made partly responsible? Presumably yes! Stirring liquids will cool them down. A recent paper assumes: In the North Sea and Baltic, the thermal air-sea coupling is strongly controlled by the seasonal cycle of the air-sea temperature difference, which changes its sign twice a year. In addition to that, winds and storm have an active large impact on the mixed layer depth. The mixed layer thickness in turn controls how fast the ocean will adapt to changes in the atmosphere and how fast a new equilibrium is reached . This view is too narrow. More mechanisms are at work. Not only ‘winds and storms’ have an impact on the various sea layers over the entire depth of the sea; Several thousand offshore facilities on the bottom of the sea or anchored offshore wind turbines divert currents at sea and influence tides and currents as a permanent resistance against the normal flow of huge amounts of ocean water. Many ship propellers are plowing through the sea stirring the surface layer to a depth of 15 meters. In the North Sea and Baltic there are continuously ten thousand motor ships at sea. The result is like stirring soup. During the winter season warm water will come to the surface and the heat will supply the atmosphere with warmth. The air will become warmer and the winters will be milder. The correlation is not to be underestimated. Long distant implication, as far away as the Eastern U.S. in January and February 2015, cannot be excluded. Climate research or agencies overseeing marine activities pay little attention for such considerations. The situation at the beginning of the evaluation is obvious. 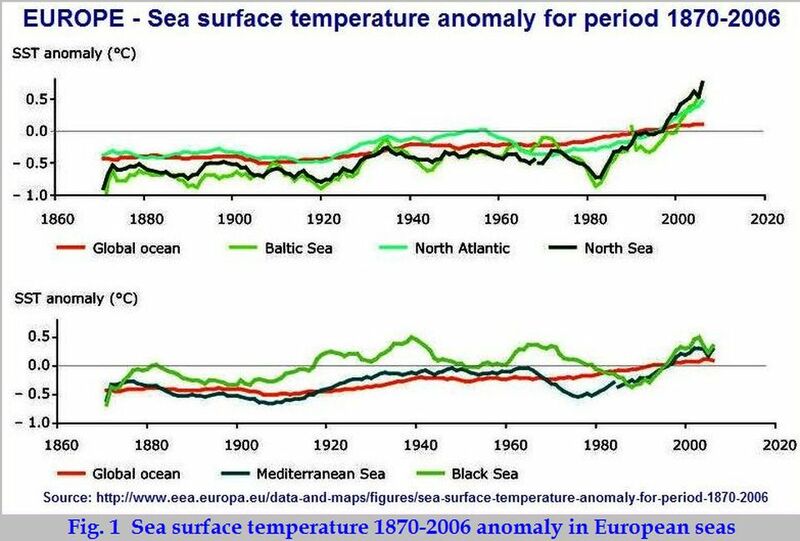 Over the past 25 years the rate of increase in sea surface temperature in all European seas has been about 10 times faster than the average rate of increase during the past century. In five European seas the warming occurs even more rapidly. 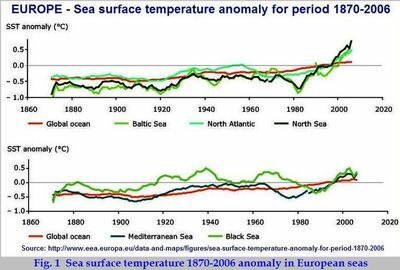 In the North and Baltic Seas temperatures increased five to six times faster than the global average over the past 25 years, and three times faster in the Black and Mediterranean Seas. . 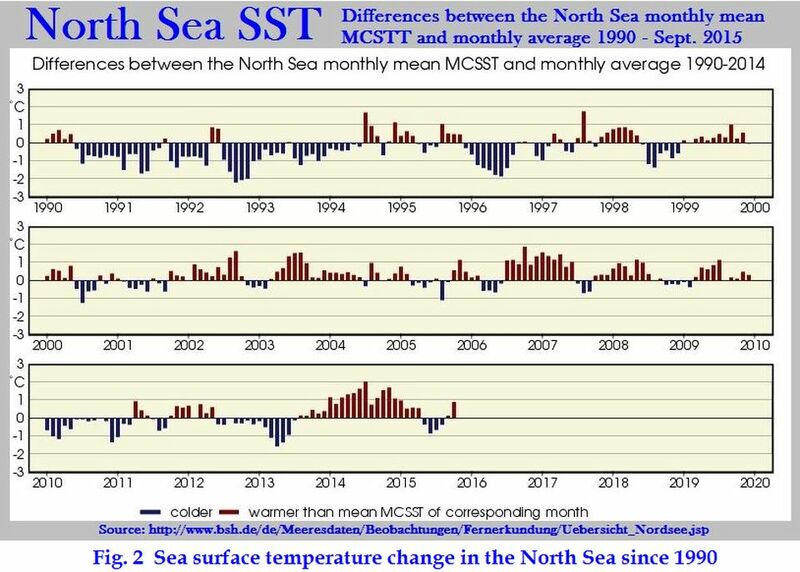 In about 1995 SST (sea surface temperature) between the North Atlantic, North Sea and Baltic were at the same level (Fig. 1), while the latter show a dramatic increase since. 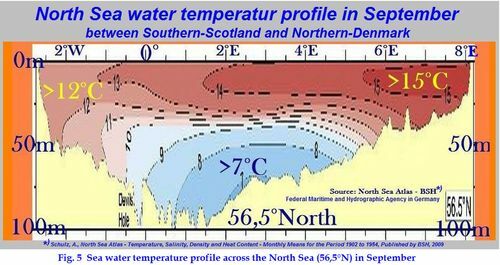 With 11.4 ° C as annual average, the temperature of the North Sea surface water was 1.5°C higher than the long-term average (Fig.2). The same is reported about the Baltic. This had a direct influence on air temperatures. During the period 1871 – 2004 there were significant positive trends in the annual mean temperature for the northern and southern Baltic Sea basin, being 0.10 °C/decade on average to the north of 60° and 0.07°C/decade to the south of 60°N. The trends are larger than for the entire globe which amount to 0.05 °C/decade (1861 – 2000), assessed a BALTEX Conference in 2006. · The length of the growing season and the sums of positive degree days have previously been shown to increase, whereas the length of the cold season and the frost days has decreased. · The start of late autumn (i.e. the end of the growing season, indicated by a continuous drop in daily mean air temperature below 5°C) occured 8 days later and the start of winter (indicated by the formation of a permanent snow cover) 17 days later. · The duration of summer increased by 11 days and of ‘early winter’ by 18 days, while the duration of winter proper has decreased by 29 days. · The length of the growing season (defined by a daily mean air temperature permanently above 5°C) increased by 13 days. The Helsinki Commission (HELCOM) confirmed in 2013 that “On average since the late 19th century” the increase in annual average surface air temperature has been 0.11˚C per decade in the northern Baltic and 0.08˚C in the southern Baltic compared to the global average of 0.05˚C per decade.” . The difference between North and South can be explained by the fact that the southern Baltic is shallower than the eastern Baltic. That means there is less volume of water available for storing heat (summer) and releasing it (winter). The over proportional warming of water and air is self-evident. To link this to global warming cannot be convincing. How can global warming lead to specific higher warming in these regional seas? 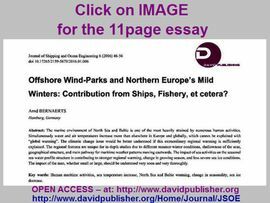 Rather, it should be asked; have shipping and offshore activities contributed to global or reginal warming? Wherever variant water temperatures consist in a sea water column, due to internal or external forcing, an exchange between the sea layers happens at any time. As already mentioned winds and storms are observed factors . 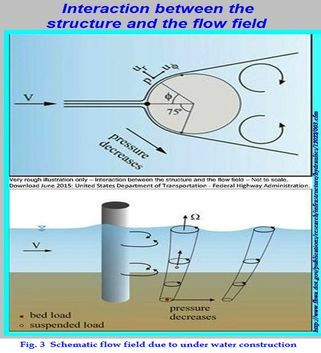 But about human forcing ‘obstacles’ little is taken into account, although it is well known that there is a strong interaction between a physical structure and a flow field (Fig.3). All offshore wind turbine units are connected with the sea floor, either by platform or anchored as floating units. The former is usually used for water depth of up to 60 meters. A floating structure consists of one or more steel cylinder filled with ballast of water and rocks, which can extend 100 meters or more beneath the sea’s surface. Currently used on most offshore wind projects, the foundation consists of a large base constructed from either concrete or steel which rests on the seabed, whereby one or more piles are driven 10 to 20 meters into the seabed. Every pile has several meters in diameter. A ‘natural’ current system, whether due to temperature difference and salinity (density currents) or tide, will be significant affected. Of not less impact is shipping. On one hand the vessel draught effects directly only the sea surface layer accordingly, on the other hand much more intensive as offshore structures due to motor propulsion. At a speed of 18 knots a ship travels about 800 kilometers in 24 hours, leaving a mixed water column behind down from few to a dozen meters. For example: According to HELCOM ‘2000 sizable ships’ navigate the Baltic at any time . By rough calculation this means, that the entire Baltic sea surface down to 10 meters and more is mixed in about two weeks’ time, or 30 times per year. That means: During the summer season more heat will be forced into deeper layers, in winter more heat comes out of the water body. 4. More heat input – More heat output. The mean water depth of the Baltic is 52m (Nord Sea 94m) and is less in the south-west than in the eastern Baltic. 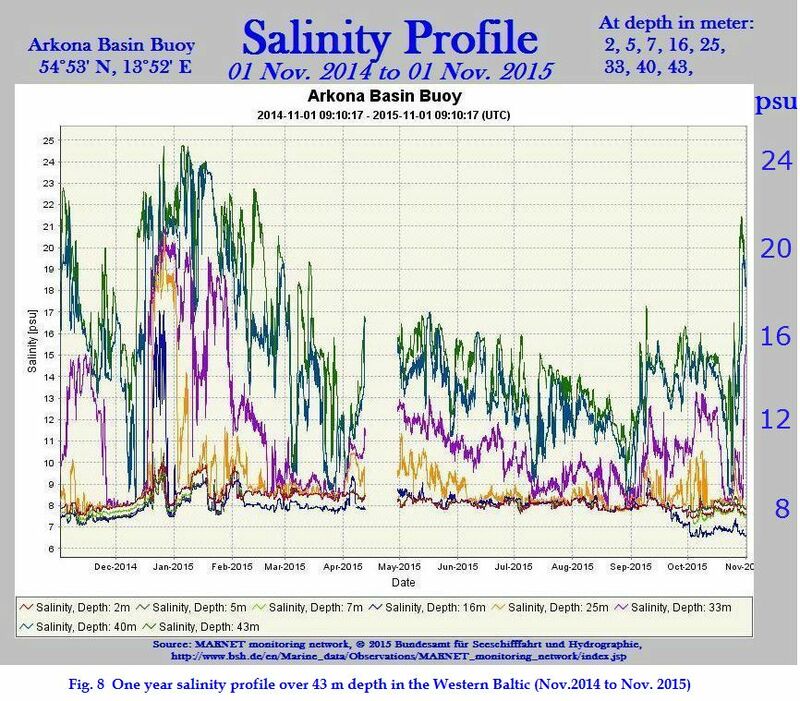 The salinity is very different from location to location, but in average considerable higher in the North Sea (32-35psu), low in the western Baltic (about 8psu), and Gulf of Bothnia near zero. As a general rule the water temperatures vary over the seasons in the upper 50 meters water column, below that depth the water is cold and remains fairly unchanged throughout summer and winter. That applies either to the North Sea as well as to the Baltic Sea. As an example may serve a quarterly vertical profile from the Eastern Baltic (close to Gdańsk Bay) (Fig. 4). 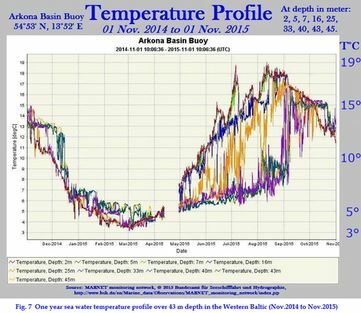 For a more detailed review of the situation at the end of the summer season, when intake of heat ends and reverse, the next two graphs indicate the temperature profiles in the two seas. In a North Sea cross section along Latitude 56,5° North during September the huge temperature the difference between the warm and cold water body is well indicated (Fig.5). Below about 40-50 meters the heat intake in summer is very moderate, as the statistical minimum from March to May is 6°C. On the other hand early September data (14 days-2015) from Arkoma Basin Buoy, in the Western Baltic (details next section) (Fig.6) indicate that the interior of the sea is much more complex as one might assume from Figure 5. In the example, Figure 6, the temperature difference is up to 12°C in the range of less than 50 meters depth. This section can only serve as an example, as every location in North Sea and Baltic has a big story to tell on sea water variability over the four seasons. 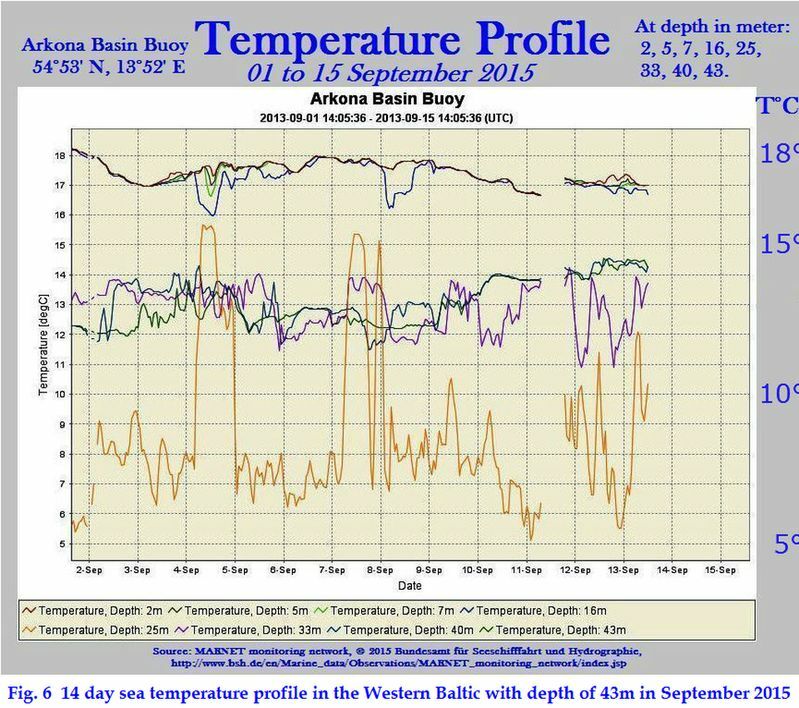 Even for the fairly well documented Arkona Basin Buoy since about 2002, only two examples – temperature and salinity - can here be presented. The measuring device, operated by the Federal Maritime and Hydrographic Agency (BSH), is located at Position 54°53’N, 13°52’E, covering a depth of about 45 meters. Many offshore wind farms have been erected in the Western Baltic in recent years. Ship traffic is very high. The next two graphs give the temperature and salinity profile of 9 respectively 8 levels during the last 12 months, November 2014 to November 2015 (Fig. 7, 8). From January to the end of March temperature decreased combined from14°C to the annual minimum of 3-4°C until March/April, still significantly too high to freeze. Since May a gap between upper and lower level emerged, culminating in August to about 12°C, narrowing the margin during the 4thcalendar Quarter. 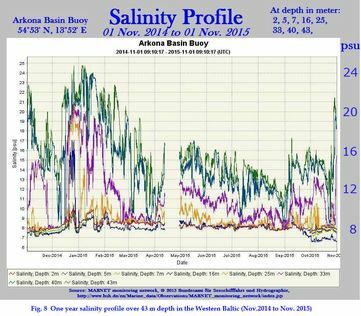 Also the salinity profile is highly variable between 7psu and 25psu during the last 12 months (Fig.8). Any obstacle or screw driven vessel will cause a shift, and subsequently a shift in internal physical forcing. 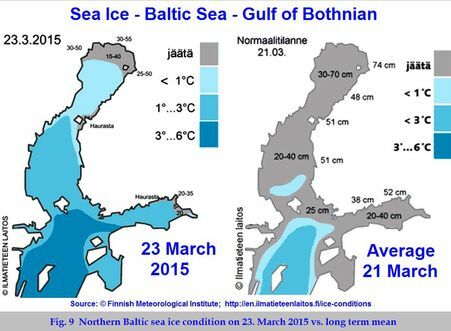 Sea ice conditions in the Baltic have been systematically monitored for more than a century. But never the question has been raised whether human activities have ever contributed to the fact, that the last near complete ice-cover in the Baltic Sea occurred one quarter Century ago (1986). 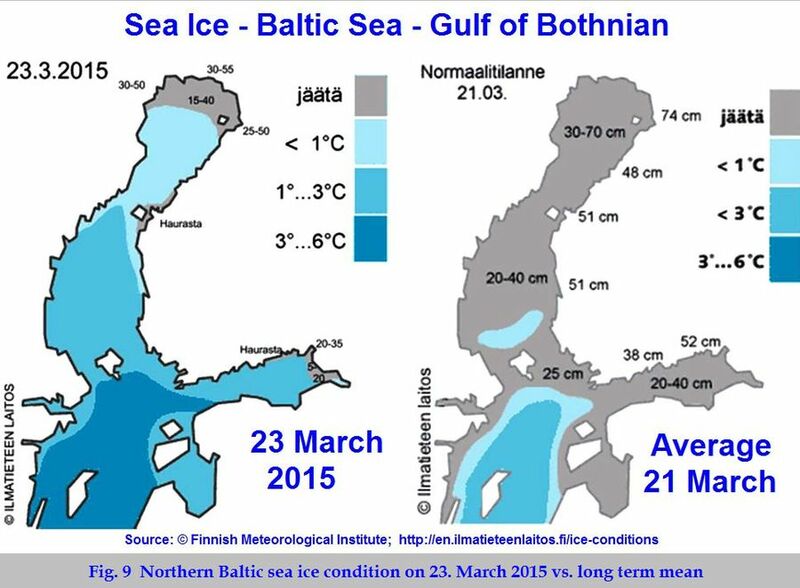 Last winter 2014/15 the Gulf of Bothnia remained almost free of sea ice, and reached by mid-March only a fraction of normal (Fig. 9). “Ship-induced waves are known to prevent the formation of a permanent ice cover in autumn and also to enhance break-up of the ice cover in spring, and so an increase in the size of vessels and the intensity of shipping activity could also affect ice conditions.”. How can it be ignored that the water body below a sea surface of zero degrees is usually warmer, and ships and other obstacles force warmer water to the surface. The shrinking ice cover correlates well with an increase in human activities, and subsequently leading to higher air temperature throughout the region. 4.4 Warmer Europe’s distant implication by the ‘Siberian Express’? Europe is not the world. However Western Europe is under the influence of the weather system from West to East. Atlantic low pressure areas move east, unless cold continental high pressure air blocks them. These are the winters that Europe talks about. This succeeds very well when the North Sea and Baltic do not assist the Atlantic weather because they cannot release enough heat or are hindered by sea icing. During last winter 2014/15 they served as perfect helpers and keep the cold from Siberia at a safe distance. 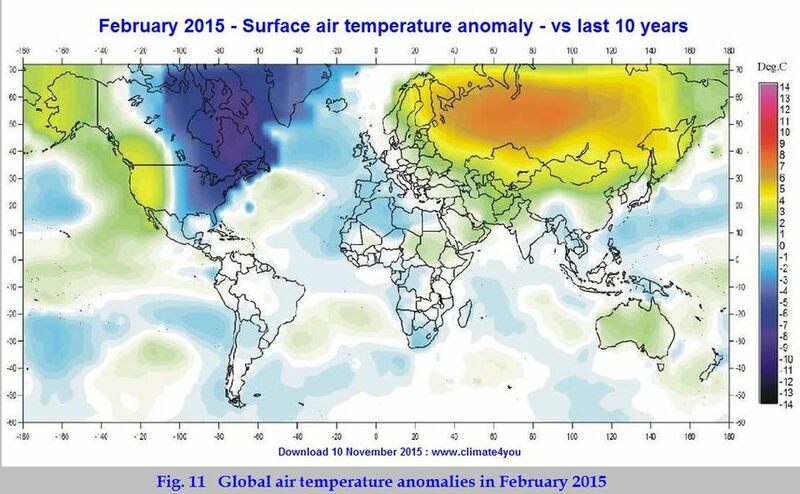 Perhaps North Sea and Baltic have contributed to the extreme cold in the U.S.A., at least a bit (Fig. 11), which should not be ignored but the mechanism must be understood. A. Regional seas in Northern Europe are minor from size and volume in global ocean affairs. Weather is “done” elsewhere, but every location contributes to the global picture. In the case of N-Europe it may be more significant as weather can be divided in maritime and continental influence, and due to the global air circulation from West to East, it is a gate. It may support the flow of warm wet air eastward (low pressure), or stem it by dry and cold continental air (high pressure), by diverting low pressure areas– in extreme circumstances - towards the Bering Sea or Mediterranean. In so far the North Sea and Baltic play a crucial role in how to open or close this gate. But according to SST statistics, the gate sea area warming increase more than in other sea areas in Europe, and here stronger than the oceans worldwide (Fig.1). This phenomenon is not explained with a general reference to ‘global warming’. A reasonable explanation is pending. Many “weather factors” may play a role, such as river runoff, precipitation, cloudiness, sea ice cover, but that has not yet lead to a sufficient conclusion, as none of them can be regarded as a driver in climatic matters. The major player in this respect is water, and the genuine mass of it is contained by the oceans and seas. Smaller water bodies are no exception. Geographical features, as the Norwegian high mountain range, which hinders the free flow of Atlantic air eastwards, provide a particular scenario to study and understand how much the water body in lee of the barrier contributes to the regional weather and climate. The sea water condition in the North Sea is not less interesting, as it is the main gate on how the west-wind flows. 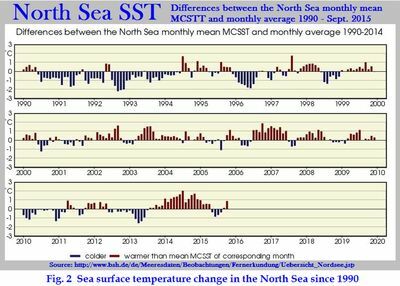 If SST rise in the North Sea more than elsewhere (section 2) and human activities rise as well, the influence on the temperature profile Fig. 4-8 is a serious issue. During summer more heat is pushed down, but available for release during the winter season. The down push is a merrily mechanical exercise, while the interaction between the sea surface and the atmosphere is a highly complex matter requiring certain conditions. Thus it is easier to force heat mechanically into the sea body, while it takes some time until ‘natural processes’ release the ‘additional’ heat according the laws of physics. It is almost unthinkable that the seasons remain stable (section 2). Until June the water body is still fairly cold (Fig. 4, 7), whereas the upper surface layer gets lots of sun rays and warms. Any moving vessel replaces the warm layer with colder water. The air gets less vapor, which support high pressure, continental condition with fewer clouds and more sunshine. For famers the growing season may start earlier. 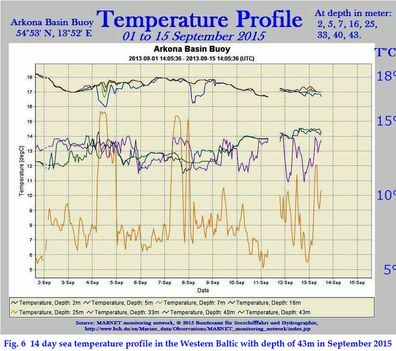 For a clearer picture one would need data, as provided by theArkoma Basin buoy (Fig. 6-8) in a high number, presumably from many hundred stations. The winter season is a much easier situation for climate research. The reason is simple. The ultimate factor in the climate system, the sun, has a low inclination, the nights are long, and the sea receives only a moderate amount of sunrays. The scene is governed by lows from the Atlantic, continental highs, and the heat release from North Sea and Baltic. The surface layer transfers more heat to the atmosphere as it receives from the sun, and cools down quicker than sub-layers (Fig. 7). The interchange between the layers depends primarily on internal physical processes (temperature, salinity, and others), and on external forcing such as wind and numerous human activities. Both factors force a much higher and rapid heat transfer. The winters are getting warmer. It surprises that science pays so little attention on the mechanism during the winter season, and neglects the impact of human activities. 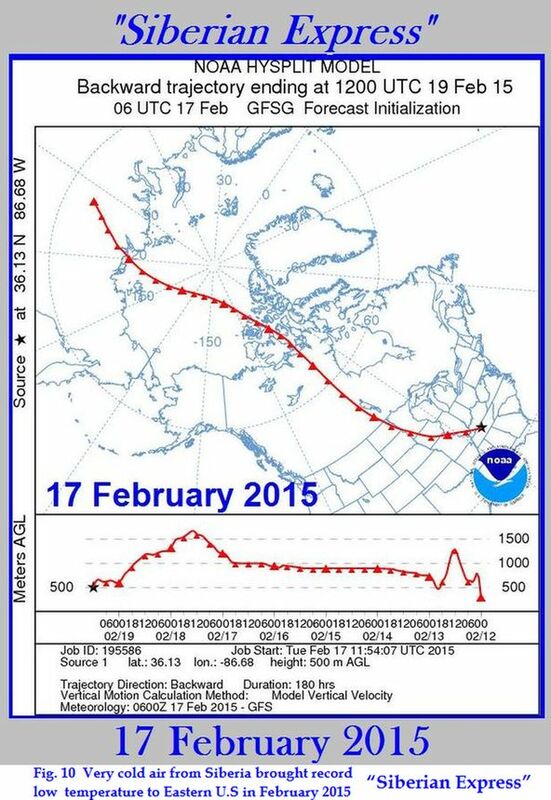 Presumably an even more convenient case for studies is sea ice condition. The annual period for analyses is shorter (about December to April). 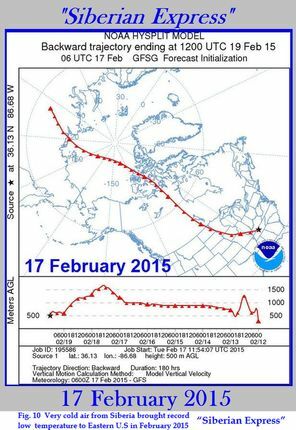 From the moment sea ice has established, the influence by wind diminishes. Human activities rise to a big player in the sub-surface temperature and salinity water structure. 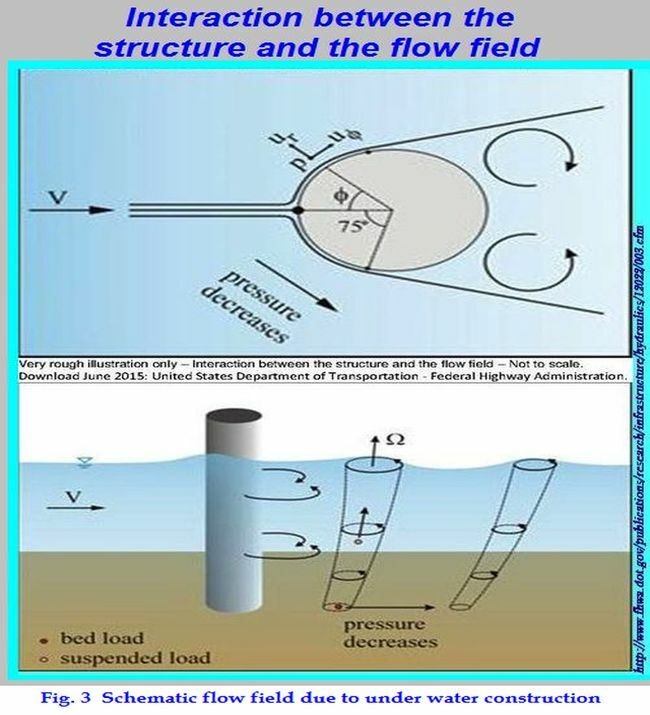 Motor vessel impact goes much further than: “Ship-induced waves prevent the formation of a permanent ice cover in autumn and also to enhance break-up of the ice cover in spring (section 4.3).They churn a water column down to ten meters and more. SST can easily change from zero to several plus degrees. Very critical is the impact of vessels navigating in ice-fields, when the water body is cut-off from interaction with the atmosphere. As warmer water is less heavy as colder water any vessel’s wake spreads below the ice bottom. Although sea ice mechanism and duration is intensively observed and studied in the Baltic Sea since the nineteenth century  the impact by human activities in the marine environment received hardly any attention. C. The biggest impediment to explain the disproportionate warming convincingly is of a fundamental nature. The dominant role of the sea in climatic affairs is too little recognized. Without this requirement, a sustainable scientific work cannot be organized. So an organization then requires a major effort in terms of concepts, data, computer capacity, competent researchers and a lot of money. 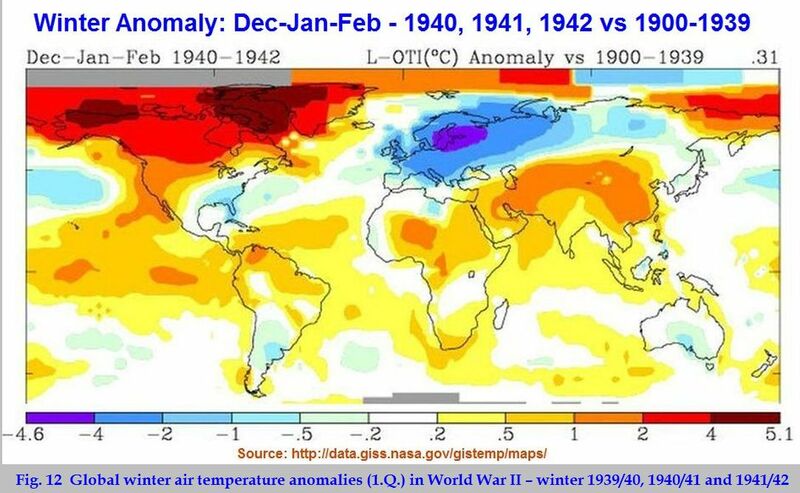 A much cheaper way – at least about the role of the sea in climate affairs – to analyze and explain the extraordinary war winters in Europe, particularly 1939/40, 1940/41 and 1941/42 which is still pending . From September 1st, 1939 until Pearl Harbor in December 1941 naval warfare was primarily a European affair, and the bulk of naval activities took place in North Sea and Baltic, releasing too much heat stored in the sea too early, thus allowing cold air from Siberia to take reign over Western Europe up to the Ireland (section 5.A.). Across large parts of Europe temperatures dropped to Little Ice Age level (Fig.12). The facts are conclusive. ‘Global Climate Change’ cannot cause a special rise in temperatures in Northern Europe, neither in the North Sea nor the Baltic or beyond. Any use of the oceans by mankind has an influence on thermo-haline structures within the water column from a few cm to 10m and more. Noticeable warmer winters in Europe are the logical consequence. Gröger, Matthias; Dietrich, Christiab; Meier Markush H.E. ; Schminake, Semon, 2015; „Thermal air–sea coupling in hindcast simulations for the North Sea and Baltic Sea on the NW European shelf”; Tellus A 2015, 67, 26911, http://dx.doi.org/10.3402/tellusa.v67.26911; PDF, page 2. European Environment Agency (EEA), 2015;”Rising sea surface temperature: towards ice-free Arctic summers and a changing marine food chain”; http://www.eea.europa.eu/themes/coast_sea/sea-surface-temperature BALTEX Assessment of Climate Change for the Baltic Sea Basin, 2006; International Conference Göteborg, Sweden 22 – 23 May 2006; http://www.baltex-research.eu/BACC/material/IBS_No35_BACC; PDF, page 7. The BACC II Author Team (Editor), 2015; “Second Assessment of Climate Change for the Baltic Sea Basin, Regional Climate Studies”, Open access at SpringerLink.com, pages 501 (Chapter 4, A. Rutgersson et al, p. 83f). op. cit. (Footnote 7), p. 145.
. Bernaerts, Arnd; 2012; “Failures of Meteorology! Unable to Prevent Climate Change and World Wars? Oceans Make Climate!”, BoD Norderstedt, pages 232, online: http://www.seaclimate.com/ . 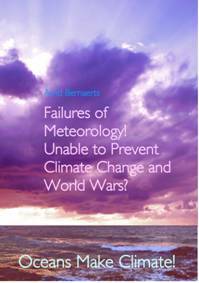 The same: 2005; “Climate Change & Naval War”, Trafford Publishing, CA/USA, pages 236, http://www.2030climate.com/ . Kindly look in again, and if you have suggestions email to: dr_arnd@yahoo.de.